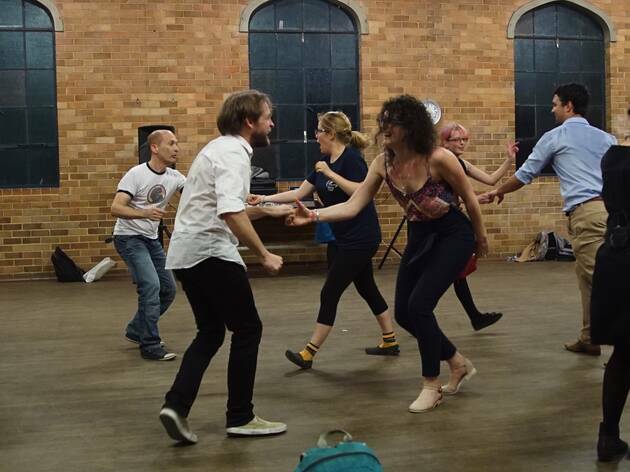 You’re going to need to be OK with close proximity to strangers if you drop in for a Total Beginners lindy hop class hosted by Swing Patrol at St Stephens Church Hall. 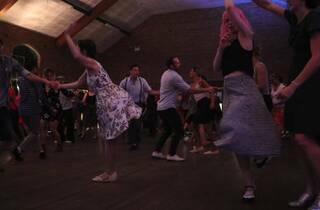 They get top points off the bat for the authentic feel of the venue – you could easily imagine that you’re in an English village hall during WWII while you’re Charlestoning around the hard-worn timber floor. 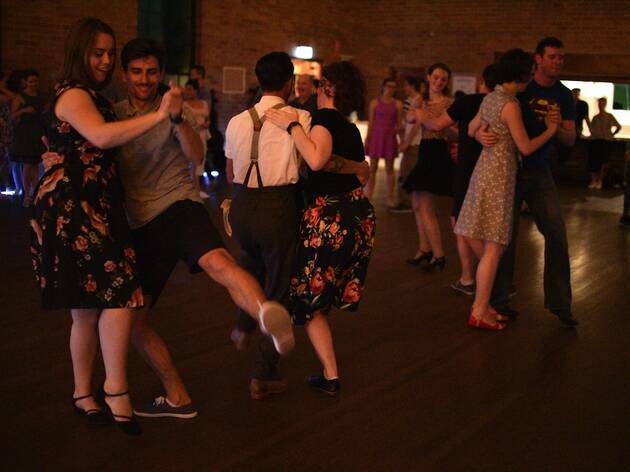 Bonus points if you can time your visit for the handful of times a year when they even put on a live band for social dancing after the classes finishes. 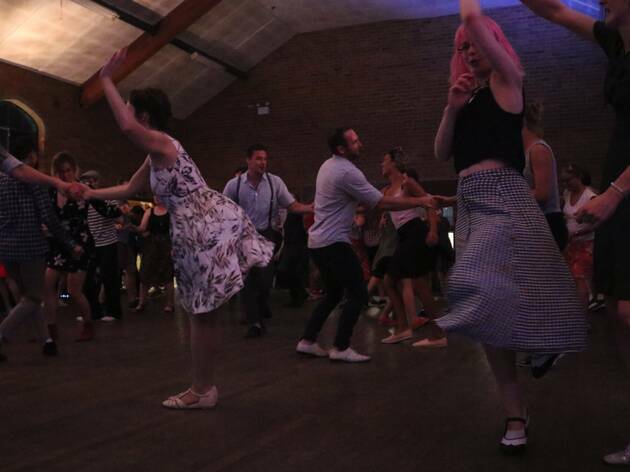 And while there are definitely people in casual clothes, there are also lot of full skirts and dancing shoes so don’t be afraid to get into the theme if you fancy it. Teachers Trish Carruthers and Derek G have a unique challenge: how do they make a drop-in class accessible and welcoming to an absolute beginner like us, and also keep it interesting for their regular students? 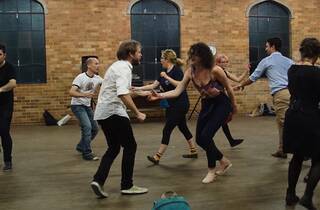 Each class is structured so that you learn a complete set of moves that you could repeat throughout an entire song and you’d be dancing. 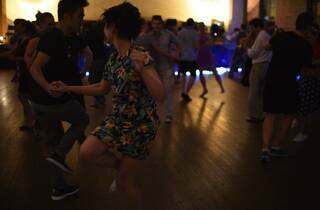 For more experienced dancers, those moves can pad out their existing repertoire. 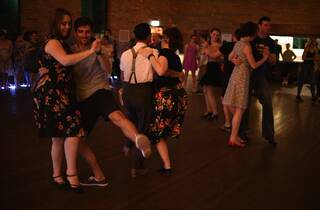 There are at least 40 people there on our visit, and we start in a giant circle doing simple warm up movements to the vintage swing soundtrack. Everyone is wearing a nametag to begin with, but these get sweated off with time – it’s a physical style of dance and you’re rarely stationary (there are breath mints and antiperspirant by the door. Smart). So who is here with you? 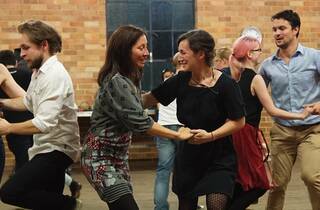 It’s a diverse mix of people, ages and genders, with many won over by the clear structure of the dance style. “Anyone with a technical but creative role, like IT, graphic designers and engineers are drawn to it. 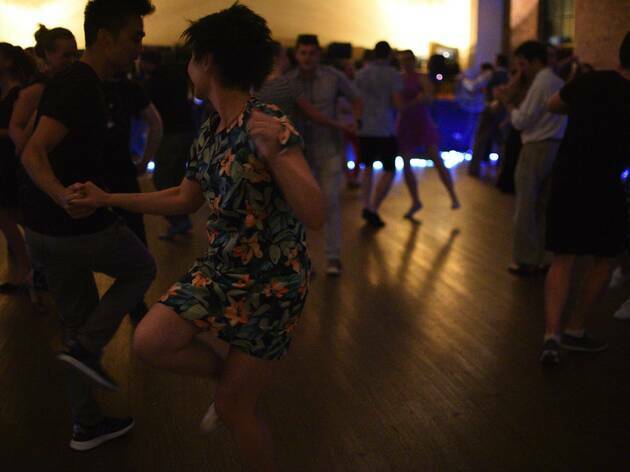 And if perhaps you’re socially awkward, the dancing itself gives you something to talk about. Everyone is here is to have a good time,” says Derek. 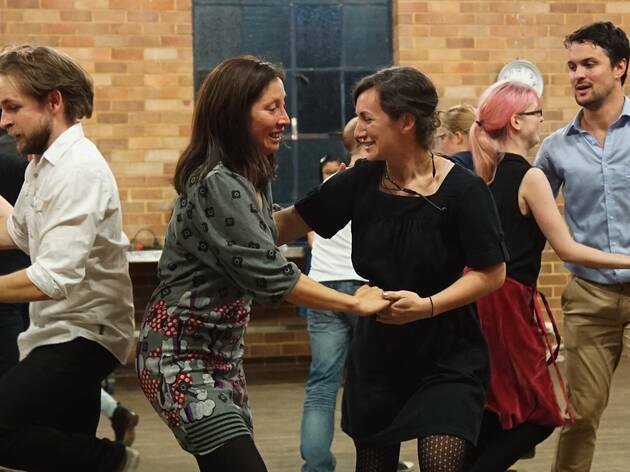 Swing Patrol also run classes across the city in Glebe, Paddington, Chatswood and North Sydney, and you can drop-in for a spin for $18 (cash at the door).